John Naas from Blackline Consulting presented the final IT Strategic Plan and recommendations. The town is now in a position where long-term “band-aid” solutions have created an IT infrastructure and technology gaps where the town is no longer able to meet the pressures and demands to provide appropriate service levels. This means catch-up and a large financial investment over the next 10 years. At the Feb 21 Council meeting Alderman DiFlavio stated that it was important that Planning develop protocols so they “won’t be going in blindly” when negotiating community benefits in exchange for granting developers increases in height and/or density under Section 37 of the Planning Act. A consultant was hired and the report was anticipated end of April. Many other local municipalities have protocols in place that recognize these aren’t last minute decisions, and include public consultations in the initial stages of discussions to ensure a transparent, fair, predictable framework and valuation that spells out exactly what the impacted community will receive. Yet, on April 17th Council chose to steamroll through approval for $100K in undefined community benefits in exchange for granting Rosebay’s height bonus to 18 and 14 storeys from a maximum of 12 storeys. Without clear justification, valuation or calculation as to how this figure was arrived at. And, after recently approving $200K in undefined community benefits for the LJM height bonus to 15 storeys. Considering the consultant’s report was supposed to be due any day, and these are important planning decisions for the community, why not slow down and make sure this is done right… or are developers pushing the steamroller to avoid paying “fair market value”? A by-law was passed to remove the holding provision on the site and allow the builder to proceed. At Council, Regional Councillor Quirk appealed the decision. 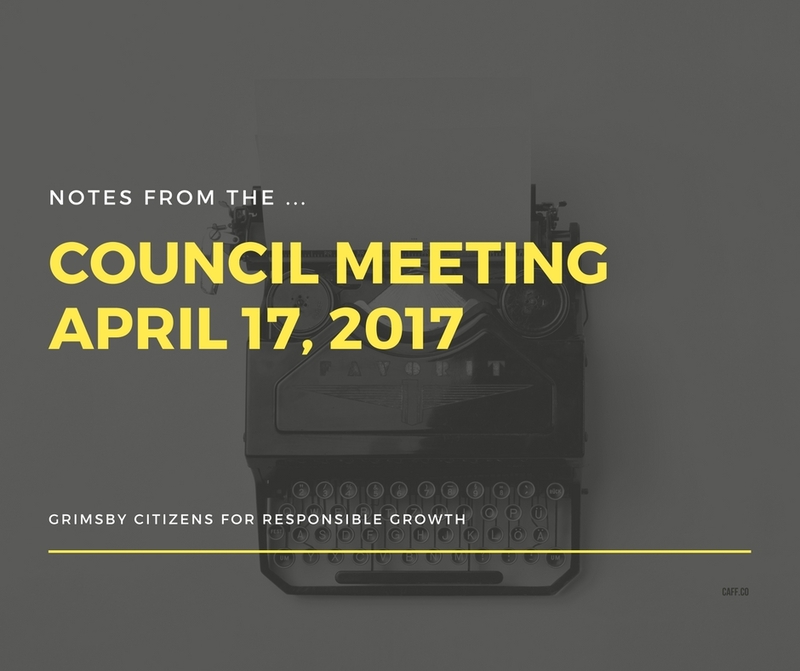 It was noted that Grimsby has contributed almost $1 million dollars since 2013 to support the pilot, without any hard and fast benefit to Grimsby. In addition, $50K more would be required in 2019 if, and that is if, the region chooses to expand IMT to RR81 to Grimsby. Meanwhile, we will be expected to continue to subsidize IMT capital and operating costs for the other municipalities. Aldermen voiced their opinion that it was unlikely Grimsby residents would use or benefit from the RR81 IMT extension and that taxpayers cannot afford it. To proceed, the region needs to receive support from a minimum of 7 municipalities by June 1 (to achieve a triple majority). On a recorded vote, Council overturned the Admin & Finance decision and approved the motion. The three dissenting votes were Aldermen Berry, DiFlavio and Mullins. Alderman Seaborn provided a status update on the consultant’s report (Dillon) noting that the committee had requested the consultant revisit the capital costs for smaller buses and provide more information on potential sources of funding to offset operating and capital expenditures. Dillon is to come back with “best case scenarios” for further review. It’s going to be a while before we see what the future of transit looks like in Grimsby. The Nelles Public School/Kennedy Road sidewalk request for proposal was estimated at $60K and has come in closer to $100K. The Allangrove portion will be removed as well as further modifications to try to bring the costs down. It seems the town’s Sidewalk Study/Review that was supposed to be in the works is not progressing and hopefully we’ll see some action on that in the near future. Safe sidewalks for everyone is important. Feel free to comment below or get in touch with your elected representatives at Town Hall and let them know what you think!